Moscow (AFP) - After a week of intense bombing in Syria Russia says it has struck over 100 targets in the war-torn country, almost all belonging to Islamic State jihadists. As troops supporting President Bashar al-Assad forces reportedly launch a major ground operation under Russian air cover, what do we know about the Kremlin's controversial campaign? Russia's defence minister said Wednesday that in the eight days since it launched the strikes on September 30 it has hit 112 targets around Syria. Russia is using some 50 aircraft based in the Syrian government heartland of Latakia that include ageing Su-24 and Su-25 fighters as well as advanced Su-34 strike aircraft. Russia's missile systems are ageing and lack the high-tech "targeting pods" used by the US. 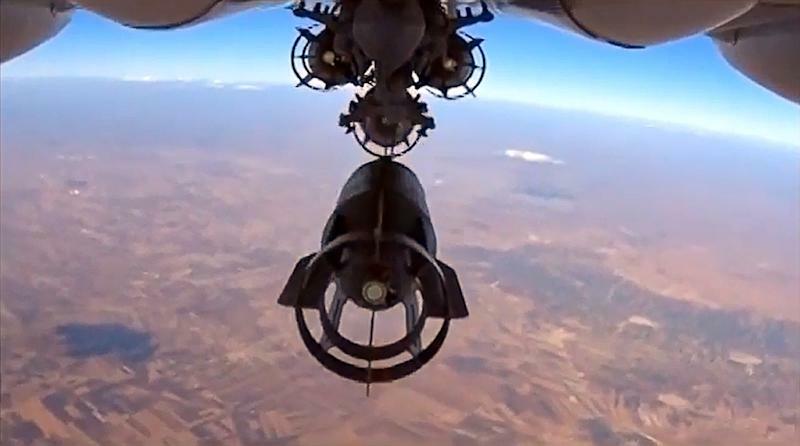 Russia has mostly been using unguided bombs dropped from medium heights although Moscow calls these precision strikes. Russia on Wednesday fired 26 Kalibr-NK cruise missiles from four warships in the Caspian Sea, around 1,500 kilometres (930 miles) away. -- What does Russia say it has hit? Russia insists that it is targeting IS and other "terrorist groups" after a request from Syrian President Bashar al-Assad. In its daily briefings the Russian defence ministry has said the strikes have hit IS positions almost exclusively and only once targeted Al-Qaeda affiliate Al-Nusra front. Defence minister Sergei Shoigu said Wednesday his forces have hit "19 command points, 12 ammunition stores, 71 units of military hardware, factories and workshops producing explosives and IEDs." Russia says it has been coordinating its strikes with Syrian authorities and its intelligence on the ground. President Vladimir Putin insists Russia's role is to "support the Syrian army's offensive operation" and reports of a major ground attack by regime forces on Wednesday suggests Moscow's bombing was aimed at softening up Assad's opponents. -- What does the West say it has done? Members of a US-led coalition that has been bombing IS have angrily condemned the strikes and say they are mainly hitting moderates opposed to Russia's long-standing ally Syrian President Bashar al-Assad. While lists of the strikes provided by the Russian military suggest some have hit IS-held territory, many seem to have struck areas where the group is not present. Turkish Prime Minister Ahmet Davutoglu on October 7 said only two Russian air strikes in Syria had targeted Islamic State jihadists. "Most of the Russian air strikes... have been in parts of Syria not controlled by ISIL (IS) but by other opponents of the regime," British Prime Minister David Cameron said on October 4. -- What do Syrian rebels say? Syrian rebels and their backers accuse Russia of targeting moderate and Islamist anti-government fighters, not only IS fighters. More than 40 of Syria's most powerful rebel factions said October 5 that Russia's air campaign had made a political solution to the conflict impossible. They accused Russia of killing at least 50 civilians in Homs province. -- US-led coalition vs Russian strikes? 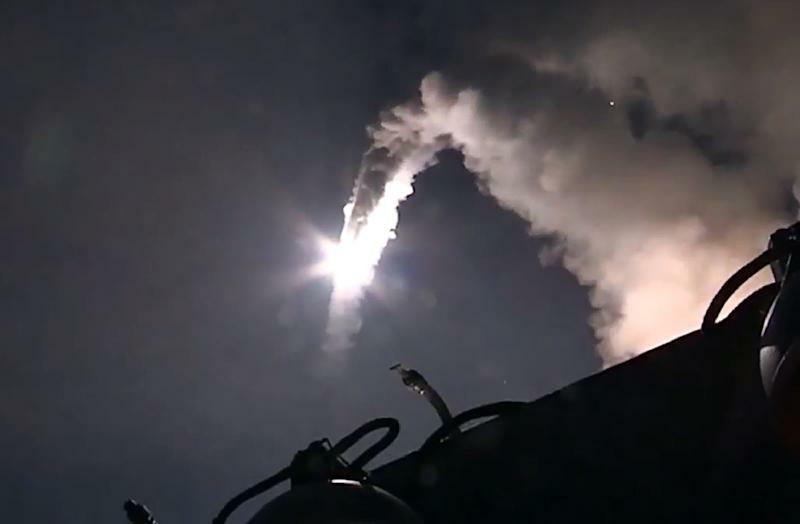 "The intensity of strikes by Russian air-and-space forces is higher than that of the coalition," said military analyst and retired lieutenant-general Yevgeny Buzhinsky. Russia also has the advantage that it "bombs targets based on intelligence from Syrian reconnaissance," said Buzhinsky. "The US has no serious ground troops that it can rely on" for intelligence and back-up, said Vasily Kashin, an expert at the Center for Analysis of Strategies and Technologies in Moscow. The US-led coalition -- which also includes Saudi Arabia, Jordan, Bahrain, the UAE, France and Britain -- has carried out more than 2,500 strikes on Syria since August 2014. It says it has not scaled back its attacks on IS jihadists in Syria due to the Russian strikes. -- What does Assad say about Russian strikes? Assad said a year of US-led strikes had failed to stem the rise of IS. "The alliance between Russia, Syria, Iraq and Iran must succeed or else the whole region will be destroyed," Assad said. Russia says it will be a prolonged bombing campaign against IS and other extremist groups. A senior pro-Kremlin politician, Alexei Pushkov, said on French television that the strikes would last 3-4 months, before withdrawing his comments. The Kremlin has denied suggestions Russia is planning to send ground troops to Syria.